Dr. Karl is known in many circles as a founding father of psychiatry; he produced 15 books that influenced psychiatry over the years. These four black and white photographs show his family. Dr. Karl, his father Dr. C.F., and his brother, Dr. Will formed a group psychiatry practice in 1919. The Menninger Clinic as a sanitarium was established in 1925 with the purchase of a farm house and admittance of 12 patients. Their philosophy was that mental illness could be treated with an integrated medical, psychodynamic, and developmental approach for the total health of patients. It is now a leading psychiatric hospital dedicated to treating individuals with mood, personality, anxiety and addictive disorders, teaching mental health professionals and advancing mental healthcare through research. It was located in Topeka, Kansas, from 1925 to 2003 and is now in Houston, Texas. Karl A. Menninger, M.D. 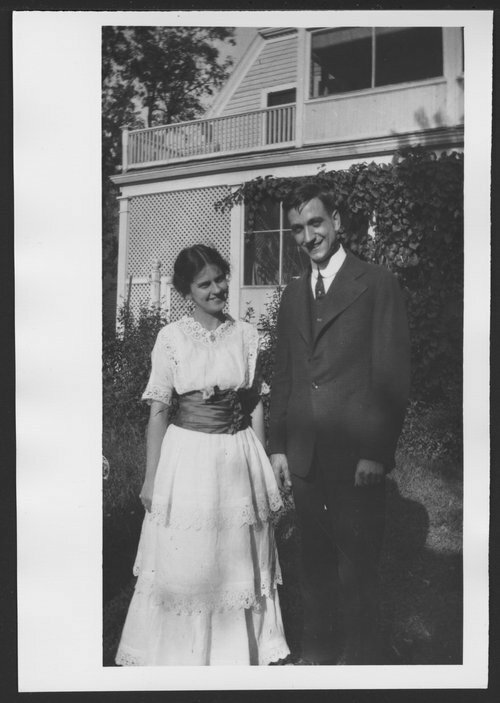 - Karl Menninger and Grace Gaines, his first wife, in 1919.